Dealing with learner drivers can be frustrating for some due to often being a little slow in terms of moving off and in general speed. Due to learner drivers often being unpredictable and less experienced in both road conditions and vehicle controls, it is advised to provide them with a longer reaction time to situations on the road by increasing your following distance. This is especially important on the approach to junctions and roundabouts where statistically most accidents occur and where learners may use excessive and unpredictable braking. L plates are used precisely for this reason; to warn other road users that a little patience and distance is required. It is a legal requirement for learner drivers to display L plates whilst driving a car on public roads. In Wales, ‘L’ or ‘D’ plates must be displayed. 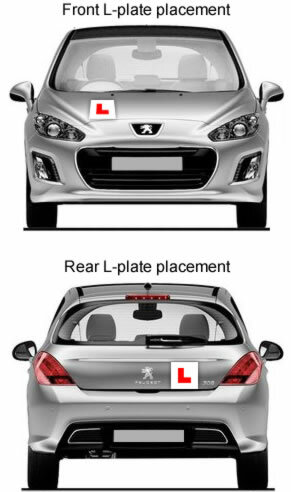 Rules state that an L plate must be clearly on display at the front and rear of the vehicle. You may display more than one set of L plates if you wish. This can prove beneficial if an L plate falls off. Fines and penalty points vary for not displaying L plates. If a learner driver is stopped by the police for failing to display, or failing to correctly display L plates, penalties range from advice and a warning issued to the driver, or up to six penalty points and a fine. Typically a fine of £100 and 3 penalty points is issued in the form of a Fixed Penalty Notice. This falls under the offence of ‘driving otherwise than in accordance with a licence’ – code: LC20. L plates must meet regulation size to remain legal for road use as detailed below. Trimming L plates is an offence and is typically undertaken by learner motorcycle and moped riders. Other rules state that L plates must be kept clean, to not be defaced or excessively damaged and placed in a highly visible location. When not teaching a learner to drive, L plates should be removed or covered. The only exception to this are driving school vehicles. There are no laws or rules on where to put L plates. The Highway Code allows for a degree of common sense in this matter by simply stating that they ‘must be placed in a conspicuous position on the front and rear of the vehicle’. The word ‘must’ indicates that this is obligatory and not advisory. Failure to do so may result in offence LC20 – Driving otherwise than in accordance with a licence; being similar to not displaying L plates at all. the front grill of a vehicle as this may reduce air-flow into the engine and if the plate becomes displaced, it could go into the engine compartment. If taking the driving test in your own vehicle or hire car, you’ll need to ensure L plates are securely and visibly placed. Ensure the L plates are in good condition as the examiner may refuse the vehicle. It’s also possible that an L plate may become dislodged during the driving test and if the examiner becomes aware of this, they may stop the test. For this reason, it could be worth considering keeping a spare set in the car. 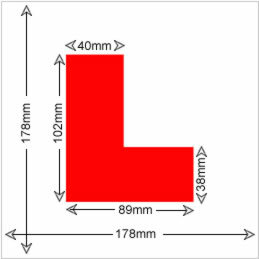 An L plate size must comply with UK regulations and should follow the dimensions on the diagram as detailed. L plates over time can become torn or bent. especially on motorbikes and it may seem logical to simply trim the edges to tidy it up. The L plate size would then not comply with UK regulation and if stopped by the police, may result in a fixed penalty of £100 and up to 6 penalty points on the learner’s licence. If your L plates become defaced, faded or torn, purchase new ones to eliminate a possible penalty. L plates vary in quality, and inferior plates often results in them easily falling off. Buying quality branded L plates generally results in better adhesion and choosing specific plates based on the surface you intend on placing them is beneficial. Self-adhesive ‘sticky back’ L plates are often secure and remain in place. However, some drivers fear using them due to overly strong glue and damage to the vehicle paintwork when removing. Self-adhesive plates are the only option for plastic cars / bumpers and aluminium cars. For magnetic L plates, there are two options; plates that utilise magnetic strips and plates where the entire rear of the plate is covered in a magnetic sheet. If you intend on placing L plates on a flat surface, magnetic sheets often stay in place well. For curved surfaces, plates that utilise magnetic strips often perform better in terms of staying in place. Whichever plates you decide on, ensure the vehicles surface is clean of dirt, dust and grease before placing them on. This sounds obvious, but a lack of sufficient cleaning is often the reason for L plates falling off. When Can You Take L Plates Off? You can take L plates off and legally drive the moment you pass the driving test. Once the examiner hands you the pass sheet, you can gleefully rip up those plates and drive home (though environmentally speaking, it’s best if you hand them to someone else to use). Sticky-back L plates that have remained in place for some time can become difficult to remove due to the adhesive hardening. If the plate doesn’t appear to peal off easily, use a cloth and bucket of hot water to heat up the plate, which should make the glue soft. Failing that, use a mild dissolving agent such as methylated spirits directly onto the glue. It is perfectly legal to print your own L plates and display them on your car if you wish to do so. Follow the page below to print out the correct legal sized L plates.